Age 22, and a member of the Fenian Brotherhood, he enlisted in Florence to serve three years, and mustered as Private, Company B, 97th New York Infantry on 14 December 1861. He was promoted to First Sergeant, Company H on 28 February 1862. He was acting Adjutant when he was severely wounded in the leg in action on 17 September 1862 at Antietam. 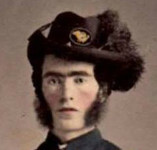 He was commissioned First Lieutenant on 7 January 1863 (to date from 15 November 1862) and was mortally wounded - his left arm "blown off" - in action on 6 May 1864 in the Wilderness, where he died of wounds in a hospital on 10 May 1864. Basic information from State of New York1. His gravesite is on Findagrave, source also of further details in an obituary from the Irishman of 18 June 1864. His picture here with the kind permission of Joseph Maghe, from a hand-colored CDV in his collection.